Restoring habitat for fish, wildlife and our community through Morse Creek Restoration. 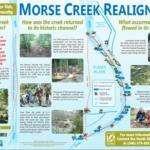 Morse Creek Restoration: Why did Morse Creek need a makeover? In the 1960s a 1,900 foot meander of the Morse Creek channel was straightened and confined to 1,200 feet, causing higher water velocity. Salmon need pockets of slow moving water to rest, gravel for spawning, and logs to hide under – unnaturally high water velocities in the straightened Morse Creek channel stripped these habitat elements away, leaving bedrock. 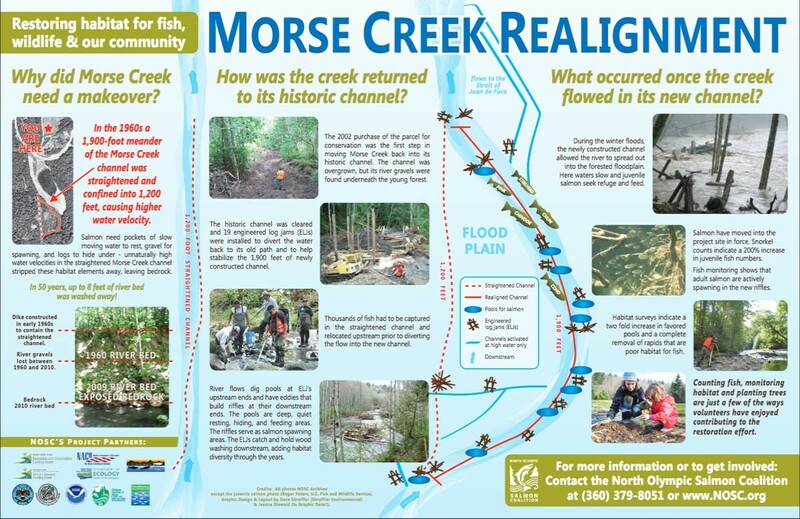 In 50 years up to 8 feet of river bed was washed away which lead to the need for Morse Creek Restoration. How was the creek returned to its historic channel? The 2002 purchase of the parcel for conservation was the first step in moving Morse Creek back into it’s historic channel. The channel was overgrown, but its river gravels were found underneath the young forest. The historic channel was cleared and 19 engineered log jams were installed to divert the water back to its old bath and to help stabilize the 1,900 feet of newly constructed channel. Thousands of fish had to be captured in the straightened channel and relocated upstream prior to diverting the flow into the new channel. River flows dig pools at ELJ’s upstream ends and have eddies that build rifles at their downstream ends. The pools are deep, quiet resting, hiding, and feeding areas. The riffles serve as salmon spawning areas. The ELJs catch and hold wood washing downstream, adding habitat diversity through the years. What occurred once the creek flowed in its new channel? During the winter floods, the newly constructed channel allowed the river to spread out into the forested floodplain. Here waters slow and juvenile salmon seek refuge and feed. Salmon have moved into the project site in force. Snorkel counts indicate a 200% increase in juvenile fish numbers. Fish monitoring shows that adult salmon are actively spawning in the new riles. Habitat surveys indicate a two fold increase in favored pools and a complete removal of rapids that are poor habitat for fish.